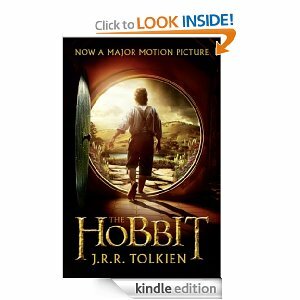 I read the book the Hobbit by J.R. R. Tolkien and I loved it. I thought it was really unique book. The idea of being in another world was awesome. There were elves and trolls and it was cross-over between fantasy and adventure. I also liked how the author was really descriptive, he would describe every little thing. It made the book even better. The action parts in the book were amazing. There were parts where I couldn’t stop reading. The things that the group fought were hard and huge. The trolls that they fought were huge and dumb, the spiders they fought with almost killed them. Plus the goblins were ugly mean things. The ending was really surprising but I liked it. I didn’t think that there was going to be a big battle scene because the main villain was dead but there was. It was a really good ending. It was action packed and I liked how the different teams got together to kill the goblins. While I was reading the book I saw the movie. But the movie had huge differences like characters that weren’t in the movie at all and the movie added people who weren’t in the book. But there was also a part that I didn’t like when Bilbo and the group were traveling it got really slow in some parts but there were cool parts. I liked how they had to fight to progress with the journey. I would recommend this book for people that like action, adventure and fantasy. Overall, I think it is worth the time to read. If you have any books for middle school boys that you would like Christian to review, send an email and we can get you set up. Brenda Ashford is the quintessential British nanny. Prim and proper, gentle and kind, she seems to have stepped straight out of Mary Poppins. For more than six decades Nanny Brenda swaddled, diapered, dressed, played with, sang to, cooked for, and looked after more than one hundred children. From the pampered sons and daughters of lords ensconced in their grand estates to the children of tough war evacuees in London’s East End, Brenda has taught countless little ones to be happy, healthy, and thoroughly well bred. In this delightful memoir, Brenda shares her endearing, amusing, and sometimes downright bizarre experiences turning generations of children into successful adults. From the moment Brenda first held her baby brother David she was hooked. She became a second mother to him, changing his nappies, reading him stories, and giving him all the love her warm heart contained. Knowing a career caring for children was her calling in life, Brenda attended London’s prestigious Norland College, famous for producing top-notch nannies. It was a sign of privilege and good taste for the children of the well-to-do to be seen being pushed in their Silver Cross prams by Norland nannies, who were recognizable by their crisp, starched black uniforms with white bib collars, and their flowing black capes lined with red silk. And what skills were these trainees tested on daily? Lullaby singing, storytelling, pram shining, bed making, all forms of sewing, cooking simple meals, and dispensing first aid—including knowing the best way to help the medicine go down. 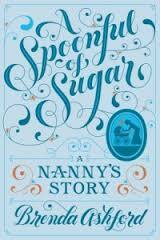 In A Spoonful of Sugar, Brenda recalls her years at Norland and her experiences during the war (after all, even if bombs are dropping, there’s no reason to let standards slip), and recounts in lovely detail a life devoted to the care of other people’s children. Sprinkled throughout with pearls of wisdom (you can never give children too much love, and you should learn how to sew a button, for goodness’ sake), this delightful memoir from Britain’s oldest living nanny is practically perfect in every way. The beginning starts out very slow. Although I appreciated the knowledge about Ms. Ashford’s specific training, I wanted to get into the meat of the book, her experiences with children. I loved the beginning of the chapters which included a nursery rhyme, tips on child-rearing and sometimes a recipe for a British dish. In particular, the tips on child-rearing have already helped me with my child. I love the fact that Ms. Ashford believes in raising children with love, not strict discipline. Her school’s motto: “Love never faileth” is demonstrated time and time again throughout her interactions in the book. I particularly found interesting her experience running a nursery during World War II. I literally felt tired just reading the descriptions of her schedule for the day which also graced the beginning of every chapter. Also, Ms. Ashford’s long career illustrated the changes that have occurred in Western society throughout the 20th century. When Ms. Ashford graduated Norlan in 1939, children were expected to be seen and not heard. Additionally, children were often segregated from much of family life. Parents often “visited” their children in the nursery for maybe two or three hours per day. All of the care of the children, from bathing, to feeding, to playing was carried out by the nanny. Newborns were often kept in the nanny’s room for the first few months with the nanny having the parents perform a few feedings per day. This is just the way it is done, especially at that time in Great Britain. Nowadays, especially in my own case, my child slept with me in my room for the first four months. I was responsible for day to day care and took my child to another location to be cared for while I worked. I would have loved having Nurse Brenda help me out during those first three months because I can no longer recall them. One issue I do have with the book is the language issues. This book looks like it was written for American audiences or at least modified for this purpose. The spellings of particular words are in American English, such as neighbor and neighbour. With the recipes included in the book, the measurements of different ingredients are given in the units customary to the United States. However, strictly British lingo is used throughout. I could determine that “nappies” are diapers, and a “pram” is a stroller, but some words I couldn’t figure out. I tried using my dictionary, and sometimes it would help, but at other times, the term was not found. I would have appreciated a type of glossary, or just the American equivalent inserted next to the word in question in parentheses. I enjoyed this book immensely, I loved the way it was written like you were sitting next to the author and listening to her review her life. This book is highly recommended if you like memoir, history and those who have an interest in child-rearing. I also wish Nurse Brenda was available for on-call duties to assist me with my spunky child. You can head on over to I Read a Book Once and enter the drawing for a chance to win a copy of this book. The first book I learned to read on my own was Fox in Sox by Dr. Seuss. I haven’t read it probably since that time. I vaguely remember that the world seemed to “turn on” once I learned how to read. Suddenly, every thing around me seemed to make more sense. I don’t know how to explain it in any more detail than that. It was like going from regular TV to HD. And I haven’t let up since. More about my early reading experiences can be found on the About section. My daughter is now of the “learning to read” age, and they are teaching it very differently in school. I never learned “sight words”. I don’t know if it was because I was in Catholic schools, but we did strictly phonics. My daughter is in public schools, and they are doing a combo of both, “sight words” and phonics. Either way, she is doing very well. I remember having Rainbow Brite books on tape, and reading along with tape when I was a kid. Now it seems like kids have no end of electronic pens, iPad apps, etc to help them learn to read. I don’t know if it was a combo of school or us reading to her or her patching things together on her own, but she is learning to read quite rapidly. Makes me think about the books I loved as a kid and the ones she loves right now. I loved the Dr. Seuss books. I loved the way the words just rolled off my tongue. I loved the way it didn’t make sense, but then it did. Hop on Pop; Red Fish, Blue Fish; The Cat in the Hat; I loved the world of Dr. Seuss as a kid. My daughter has a few of those titles, hasn’t started to read them herself yet, but she loves it when I read it fast and then sound silly. That’s my girl. I loved the Bernstein Bear books. And Little Critter. I don’t have any for my daughter, but the Bernstein Bears are now a cartoon series on Sprout. Oh, and Little Golden Books. I loved those books. Cheap, easy to read, but don’t hold up well over time. I love the books by Jamie Lee Curtis for my daughter. We have When I Was Little..; It’s Hard to be Five; and my fav Big Words for Little People. I like the way they are written with humor and illustrated in a way that really sinks in for her. Who thought a teen scream queen would turn into an awesome children’s author? My daughter’s favorite book right this second is Silverlicious by Victoria Kann. She wants this one read to her 24/7. I’m trying to get her to read some of it on her own, and she is getting there. Maybe Santa will turn into a librarian this year. I have no idea what other book series there are out there for little kids these days. All of my friends have younger kids, and mostly boys. I am hoping to acquire a Kindle Fire for Christmas so I can download free books for her as well. Not that I can’t already do that on the Kindle I have, its just that its not in color and the gray scale really won’t cut it for her. Any suggestions on first reading series for beginning little girl readers? ?